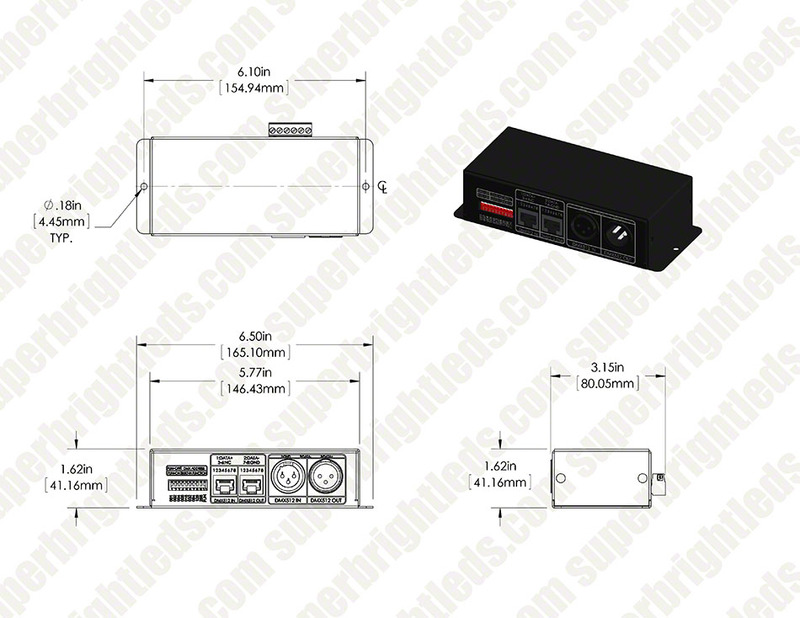 DMX-3CH-4A 4 Amp 3 Channel LED DMX Controller/Decoder: 360° View. This 3 channel DMX512 decoder can control up to 3 different 12 VDC LED products or any one RGB LED light bar or strip. 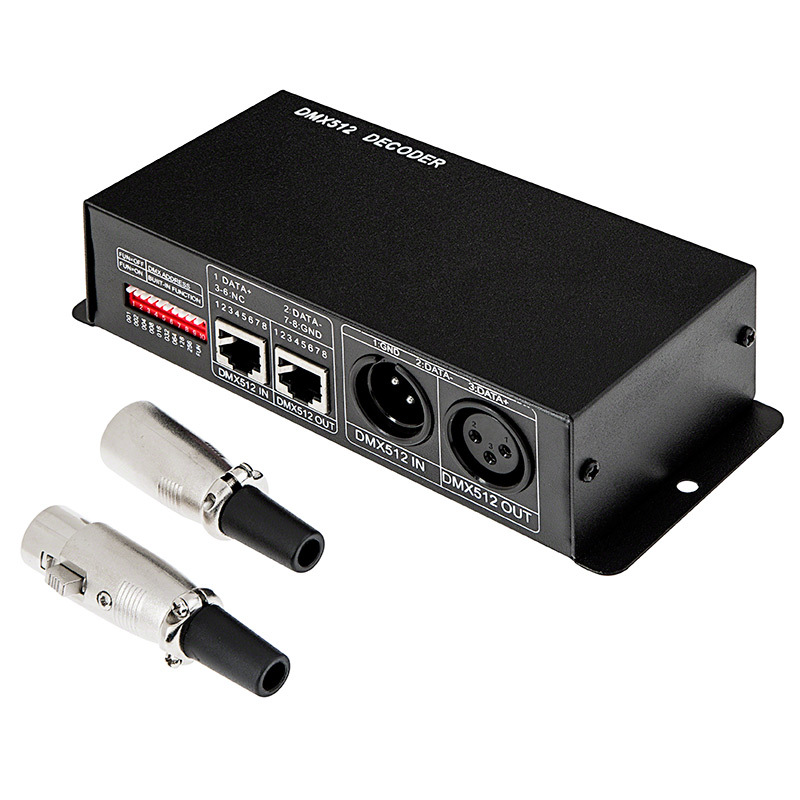 Controller can run in stand-alone mode using Address code switches or under DMX512 digital control signals using XLR or RJ45 DMX512 Input/Output interfaces. DMX decoding driver converts universal DMX512/1990 digital signal to PWM signal, which can be controlled by DMX512 console with 16-bit gray scale output per channel. Maximum load is 4 amps per channel—12 Amps total. Includes male and female 3-pin XLR connectors. 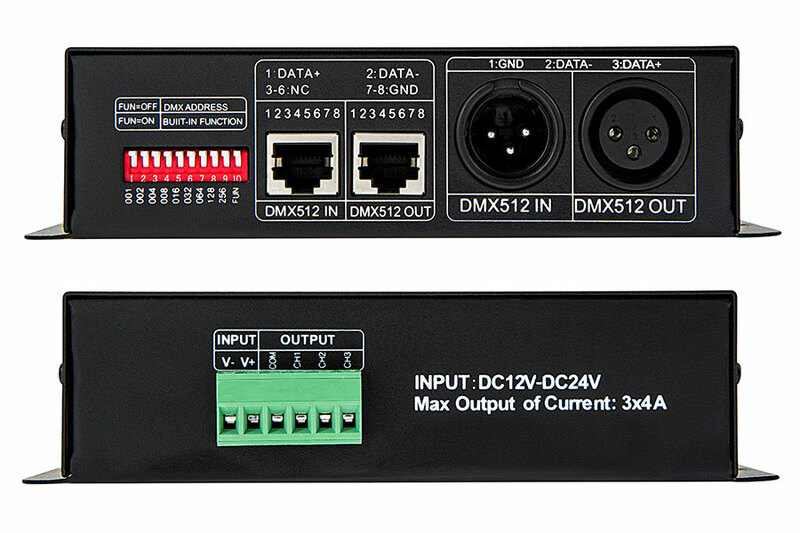 The Model DMX-3CH-4A can run on stand alone mode or under DMX control. It receives standard DMX-512 digital control signals and converts to PWM (pulse width modulation) signals for driving LEDs. Connect to any DMX digital console to achieve dimming and and various color changing patterns. Only power with 12VDC Power Supply to connect to 12 Volt Light Strips or unit will be damaged. Our Enclosed Power Supplies can be direct wired to "+" and "-" terminals on removable Green connector on side of unit. Connect according to the above drawing and note that the Green Connectors can be unplugged from the unit. This device is awesome! I never thought I could could MAKE my own LED RGB DMX controllable light someday, but thanks to this baby, I can AND have!!! !